You and your staff will stay warm, comfortable and look good at the same time with our complete line of maintenance outerwear. When the job is tough, everyone on your maintenance staff should have the proper clothing and our line of maintenance uniforms makes it easy to outfit everyone with durable, long lasting industrial outerwear that not only fits easily over normal clothing, but is also affordably priced. Take a look at our extensive line of maintenance uniforms. Everything you need is here, beginning with heavy duty industrial tees and long sleeve thermal tees, lightweight short sleeve coveralls to thermal washed jackets that will keep your staff warm on even the coldest days. We also have new maintenance outerwear items such as industrial grade gloves to help protect hands and snap-on hoods that attach to our warm jackets. 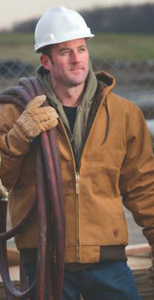 For those days when temperature and precipitation is an issue, choose from industrial outerwear such as insulated bib overalls and industrial grade insulated coveralls, hooded sweatshirts and several different types of warm jackets, all at affordable prices.